Graduates Robert Macinnis, Allan Boyd and Angus Macdonald, the executive team behind AetherWorks, and distributed data storage solution AetherStore featured in The Register last week. 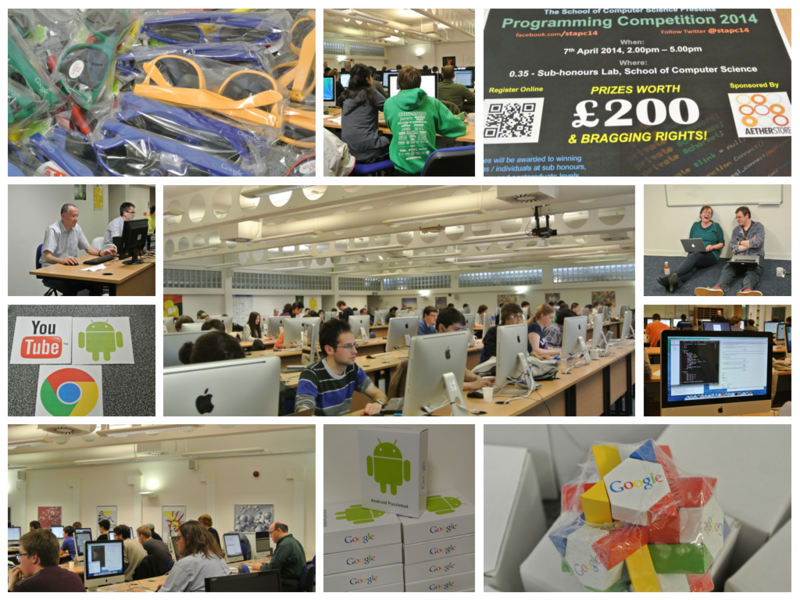 AetherWorks sponsored the St Andrews programming competition earlier this year. Further testament to the quality of our graduates, Lewis Headden and Isabel Peters have joined the successful start-up. We wish them all continued success as they near product delivery. 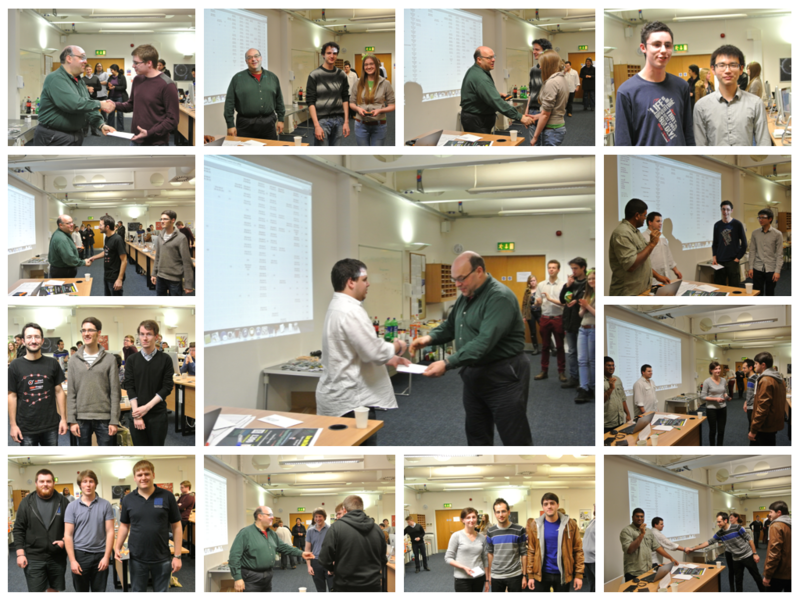 The Subhonours Lab was in full swing yesterday afternoon, with staff and students enjoying the challenge of the 2014 St Andrews Programming Competition. 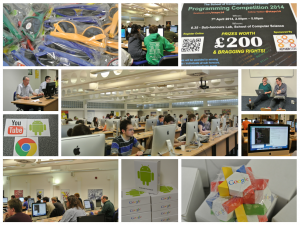 Participants and winners are pictured below along with some of the prizes and merchandise. Winners, prizes and teams to be announced once confirmed. We believe the Head of School, Steve Linton, did rather well. Words we use to describe our alumni, who work in New York, Switzerland, London and Edinburgh amongst other places. Whether working for established companies such as Adobe and Google or in their own business start-ups such as AetherWorks LLC. and PlanForCloud (formerly ShopForCloud) our graduates continue to flourish. 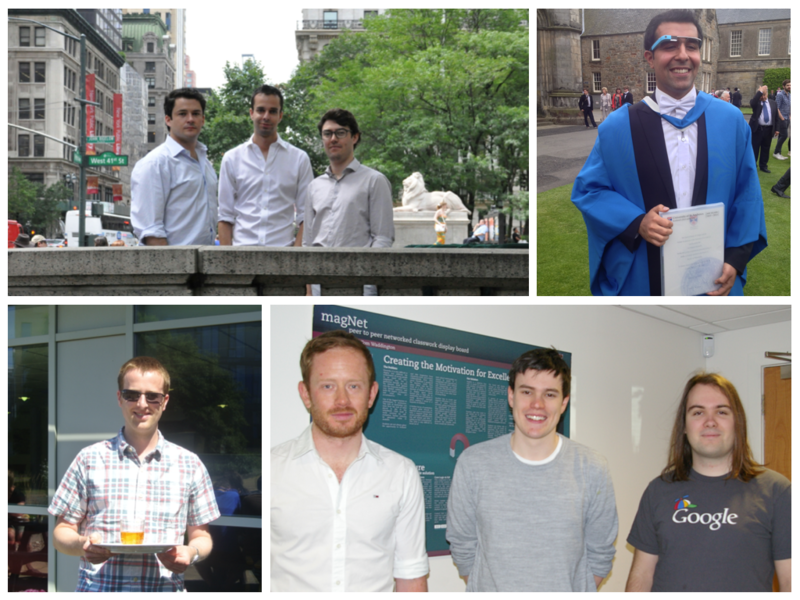 And rumour has it more of our talented CS graduates will be joining some of them shortly. The suspense! They are all exemplars of why St Andrews is the only Scottish university to feature in the 2013 High Fliers, a report about the graduate market in 2013. Rob, Angus and Greg from AetherWorks LLC., who took time out to capture a photo of themselves outside their offices in New York. Ali at graduation, sporting a colour-co-ordinated Google Glass (who knew!). Listen to Ali discuss his career at the SICSA PhD conference careers panel. We caught up with Adam, Andrew and James earlier this year when they represented Google at the Tech Talk by Google engineers. Neil (complete with sunglasses) visited the school last week, on an unusually sunny day, with colleagues from Adobe. AetherWorks LLC. : Robert MacInnis, Angus MacDonald, Allan Boyd and Greg Bigwood. PlanForCloud: Ali Khajeh-Hosseini and Alistair Scott. Google: James Smith, Adam Copp and Andrew McCarthy.